Has Barack Obama been able to pull the wool over the eyes of so many unknowing people? The answer without question is clearly yes. One of the biggest lies he has told to the American people to date is that he is a “Christian”. His former cult center Trinity United is far from being called a “church”. People go to church to worship god not race. In the case of so called churches like Trinity, people gathered to worship race and then god if time permits it. Liberal Democrats know that the main tie they have in regards to blacks is the issue of race. I don’t recall a liberal Democrat going into a church with an all or mostly black congregation then stand in front of the pulpit and say “We need to push for more abortion or homosexual rights,. Liberal politicians know better. I’ve heard liberals refer to themselves a “Christians”. I’ve also heard liberals say that Jesus Christ was a liberal. Lets start from the beginning. The term “Christian Liberal” makes a much sense as the term “gay marriage”. In other words, both terms don’t make sense. Liberals have a way of talking out of both sides of their mouths and getting their tongues tied in the process. Liberals don’t like to accept things that are tradition, they like to change laws and rules to conform to their lifestyles not the other way around. It’s pretty simple to understand why liberals have such an unadulterated hatred towards Evangelical Christians. Evangelicals are by nature Christian “traditionalist”. They conform their lifestyles around the basis of what is moral, righteous, and spiritual in aspects to biblical scripture. In other words, Evangelicals are traditional Christians. There are many other denominations in Christianity that subscribe to tradition Christian doctrine as well. Liberal politicians have tried to pose by saying they are Christians, but in the end they can’t walk the walk or talk the talk. Liberals work tirelessly to promote their champion causes of abortion and homosexual marriage, but they never bring their causes up when they step into a traditionalist Christian church. So this is where we are at right now. It’s the Christian traditionalist versus liberals trying to pose as Christians. This guy has unlocked the mystery into the mindset of the typical Barack Obama supporter. Amazingly enough, this guy is a Democrat. It's nice to know that there are still a few free thinking blacks in the Democrat Party, eventhough they are few and far between. A man of integrity and accomplishments who happens to be black. 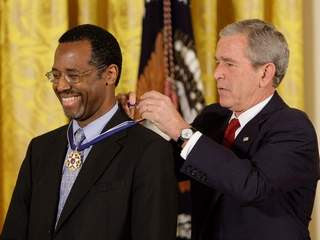 Dr. Benjamin Carson is a world renowned Neuro Surgeon who recently received the medal of freedom at the White House from President Bush. The medal of freedom is the highest award that can be given to citizens. The award recognizes outstanding individuals who have been leaders in their chosen fields. Dr. Carson more then deserves the award. Just last week he led a widely covered operation to remove half of the brain that was diseased from a little girl. When I wrote the story entitled "The black man vs John McCain" in regards to Obama, I didn't use that title for tongue and cheek. There was a logical reason. You all know that I feel Obama is merely an empty suit, and he basically attracts most of the element that is wrong with the black community. Dr. Carson clearly illustrates that all black people don't think a like. Dr. Carson has accomplished so much in his career, and he is totally humble about it. In 1987, he performed the world's first successful operation separating twins joined at the back of the head.When I contrast him to most blacks, it's a difference between night and day. Listen to this video of Dr. Carson speaking at the Meyerhoff Symphony Hall here in my city of Baltimore. Barack Obama could only wish he could speak as well as Dr. Benjamin Carson. If I had choose the perfect word to describe how he speaks, it would have to be "eloquence". His thought process is so precise and clear, it's amazing. With everything I said about Dr. Carson. He would be shunned by most of the black community especially the youth, because he dares address the problems of the black community and not try and either candy coat them or ignore then all together. I wouldn't call Dr. Benjamin Carson a "black leader", but I do consider him a "leader among men". I want to puke everything I hear a young black person say that he or she is "victim of society or racism". They are merely victims of their own ignorance and other people brainwashing them to believe it. Dr. Caron grew up in Detroit. Detroit is hardly the suburbs. In essence Dr. Carson grew up in adversity and overcame it through hard work. Most blacks in America never heard of Dr. Benjamin Carson and probably never will. That's pretty sad actually bordering pathetic. They all know the name Barack Obama I know. This all goes back to "the black man" vs McCain. 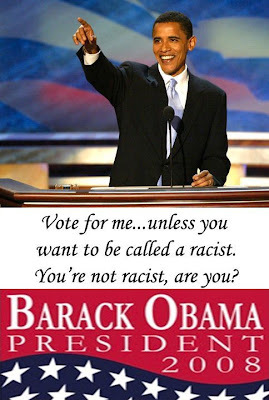 Obama has no real accomplishments, he's candidacy is merely political affirmative action. Dr. Carson on the other hand is a well qualified and respected person in his speciality who happens to be black. See the difference? Let me put it like this. Dr. Carson is world famous in the medical field not for "WHAT HE IS" but "WHO HE IS". I might have to make a part two to this story, because I haven't even scratched the surface in regards to a "REAL ROLE MODEL". This is the differrence between "SUBSTANCE" and "HYPE". This is Dr. Carson's bio, please tell me where Barack Obama even begins to stack up against Dr. Carson. Once again "substance" over "hype"
Obama says Republicans will use race to scare voters. "It is going to be very difficult for Republicans to run on their stewardship of the economy or their outstanding foreign policy"
"They're going to try to make you afraid of me. He's young and inexperienced and he's got a funny name. And did I mention he's black"
If Obama is using race as a strategy to take away the factual attacks by Republicans that he is inexperienced and naive, then its clearly going to backfire drastically. Whites are getting ticked off at Obama supporters when they call them "racists" just for criticizing Obama's stances on the issues. So the only thing he's going to accomplish with this strategy is further alienating a vital segment of the voting population that he already has very limited support in. The fact of the matter is that Republicans have more then enough facts to bring Obama down. Actually Obama sounds no better then Hillary when she way spewing that she was being attacked during the campaign was because "SHE WAS A WOMAN". This is the same playbook just replacing the name,gender and race of the Democrat candidate. I'm being attacked, because "I AM BLACK".He said he was also set for Republicans to say "he's got a feisty wife," in trying to attack his wife Michelle. I've posted several you tube videos of Michelle Obama in her own words trashing America. I guess according to Obama we are all suppose to ignore the obvious like his supporters do. It doesn't work like that. This is the best part of his speech. I guess he had the teleprompter working that day. "We know the strategy because they've already shown their cards. Ultimately I think the American people recognize that old stuff hasn't moved us forward. That old stuff just divides us," . Is Obama serious?! What cards have been shown? Does he means the cards of Jeremiah Wright, Otis Moss, Louis Farahkan, the New Black Panthers, William Ayres, Michael Pfleger, Michelle Obama's thesis from Princeton, Obama's comments from his own book "Dreams of my father"? Here's a "unifying" passage from his book. "WHITE FOLKS GREED fuels a world in need". Obama also seems to have forgotten why his support among whites has dropped like a rock in recent months. News Flash, It wasn't because of Republicans. Is this a Republican scaring voters based on race? The rising star that lowered the standards BIG TIME. The great Ronald Reagan never sounded like this stuttering fool. When will Obama supporters finally come to grips that their beloved mass marketed, shielded, empty suit is in reality exactly what I just said? I don't believe nobody in their right mind will mistake Barack Obama for Ronald Reagan when it comes to communication and speeches. Since Reagan left the White House twenty years ago, the bar has definitely been lowered. This guy is suppose to be the "rising star" of the Democrat Party? Does this sounds like a "rising star" worthy of being President? Please be honest. The media showed just how bias they can be towards a person they don't like. Once upon a time. Bill and Hillary Clinton were the most beloved political figures in our country since the Kennedy's. The media gave cover to Bill when he was president. Most blacks couldn't get enough of Bill Clinton. I remember a time if a black person spoke negatively about Bill Clinton in the presence of other blacks, that person better have had his or her life insurance paid up. Blacks had fierce loyalty towards the Clintons especially Bill. So what happened? It's like everything just flipped on a dime when Barack Obama came on the scene four years ago. Blacks dropped the Clintons like a bad habit when Barack Obama announced he was running for President. I remember when Hillary spoke with a southern black accent at a church in the south, and blacks cheered that attended cheered. I also remember when Hillary said in a black church that "congress is run like a plantation, you all know what I mean" blacks cheered again. These are just two example of how the Clintons were successful in using race to control black ignorance. The cheers have now turned to jeers instead for the Clintons. So much for loyalty I guess. I still can't figure out how as well turned on the Clintons like a bunch of attack dogs. For the last two months there was a drum beat day after day the only thing the media could report was when was Hillary Clinton going to drop out of the race. It was an obsession with the media. It never occurred to them that she had every right to stay in the race until she decided to end it. The media is suppose to be "unbias" in their reporting. That was funny I know. They dragged Hillary Clinton verbally through the mud and back over the last few months while grinning ear to ear for a relativity unknown person in Barack Obama. Poor John McCain doesn't even see it coming. Bill Clinton figured out the bias against his wife by the media when it was too late. If McCain was smart he would take notice, but he's not smart for forget that. John McCain is no longer the media's favorite "maverick" Republican. He's now considered the enemy. The media in this country is extremely manipulative. Now all of a sudden the media and the talking head pundits are talking about Hillary possibly being chosen for Obama's Vice President. The master plan of Hillary all along was for her to become President. So why is the media floating this unconfirmed scenario? The media and most of the Democrat power structure can't stand the Clintons, but they realize that Obama needs Hillary in order to win. It's really that simple. Hillary Clinton ran the map winning all of the major electoral college rich battleground states a candidate needs to win in November in order to win the White House. Also, Hillary has broad support among many Democrat demographic groups except blacks and young college educated whites. The bottom line is without Hillary's supporters backing Obama, Obama will lose big in five months to McCain. So it comes down basically to "who needs who". Hillary doesn't need Obama. Actually she could just wait for Obama to lose in November then she can run again in 2012. She realizes that if Obama gets slaughtered, his political capital is spent. He couldn't dare show his face and try a second run in 2012. That will leave Hillary Clinton as the only Democrat with any major name recognition to run. If she choose to be Obama's VP, then her presidential window is then shut for good. The media can push the scenario all they want, I don't see Hillary pushing to be Obama's VP or accepting if asked by Obama. People ask me why do I oppose affirmative action since I'm black. I always say I wouldn't want to be hired or promoted for a job based on the pigmentation of my skin. I'm a person by nature that takes pride in my accomplishments. Obama supporters really get unhinged when I refer to Barack Obama as the "affirmative action candidate". The truth hurts because in essence thats really what he is. Think of it this way. When you apply for a job, you send the potential employer your resume. Your resume lists your work history, education, accomplishments etc. The potential employer uses the information on your resume as a basis to determine if your are "qualified" for the job. Obama doesn't have a voting record as a state senator in Illinios, and he doesn't have one as a U.S Senator. Barack Obama beat an emergency stand in candidate in Allan Keyes to win his U.S Senate seat, then after a few hours after being sworn in he decided that was enough experience to run for President. There are a lot of people in the country that have done the research on Obama, and they have come to the same conclusion I have. Barack Obama based on the facts presented is an inexperienced, unqualified, opportunist. Would Obama be receiving all this attention if he was a white guy? I seriously doubt it. I'm once again just stating the obvious. The media can't stop talking about hows this election is "historic", because Barack Obama is the "first black man to win the nomination of a major political party". At least the media is honest with why they love Obama. It's not just because he's a liberal, it's because he is a "black" liberal. I guess race is the only qualification needed for higher office these days. That says a lot about our political process in a sad way. The media has coined this campaign season as "historic", and they were right in one aspect they never thought of. It's historic, because Barack Obama is the first presidential candidate in United States history to resign from his church due to the controversy his church has cased him as a candidate. The old saying goes "a nickel late and a dime short". Barack gave his resignation letter to Trinity yesterday. Afterwards he said "
"I'm not denouncing the church and I'm not interested in people who want me to denounce the church," he said, adding that the new pastor at Trinity and "the church have been suffering from the attention my campaign has focused on them." Decent, moral, upstanding people want Obama to denounce the hate that comes out of Trinity United, because they expect their would be President to be a person they can look up to as a person of character and conviction,but Barack Obama in his own words isn't "interested in people who want him to denounce the church". Barack Obama is leaving Trinity not because he disagrees with what it stands for, he even said in his book that the black value system of Trinity is what attracted him to the church in the first place. Obama is leaving the so called church to protect it from the scrutiny that it has been under since last year. Notice he said in his statement "the church have been suffering from the attention my campaign has focused on them". It never occurred to Obama that the problem wasn't with the people who focused on Trinity United. The problem was with Trinity itself and him running for president being apart of it. Why is it that no other presidential candidate or candidate that was elected president ever had a problem with their church overshadowing their campaign? Since Obama wouldn't denounce the church, how can anybody with common sense believe him when he denounced Jeremiah Wright? Wright's sermons were in line with what the church stood for. Barack likes the new pastor Otis Moss, yet Moss refereed to Jesus's disciples as "thugs", and Jesus himself as a "lover of thugs". I said before that Obama associates with some very low down shady people, and it looks like he will do anything to protect them even go as far to quit his church.